body is straight, rust free. tires are 235 85 16 super swamper trxus m/t in 85% shape. 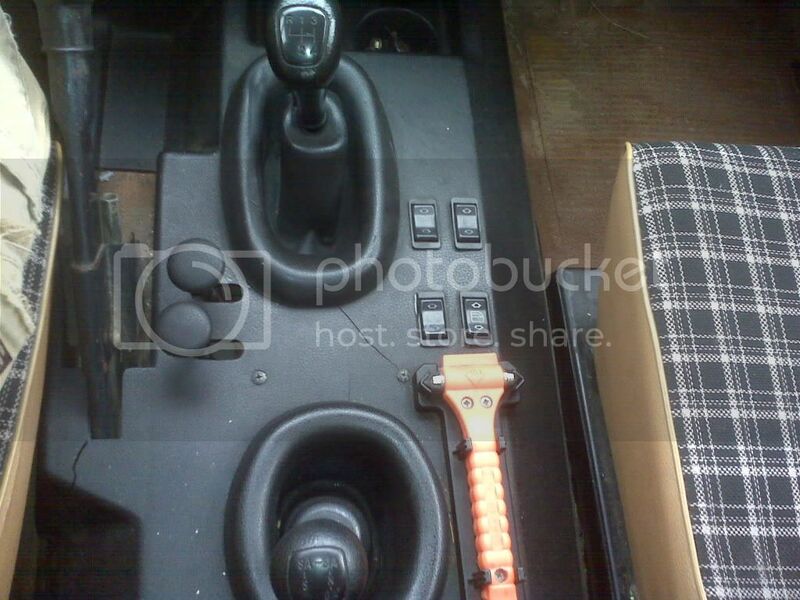 4 speed manual, factory winch, all in all a good looking and solid vehicle. 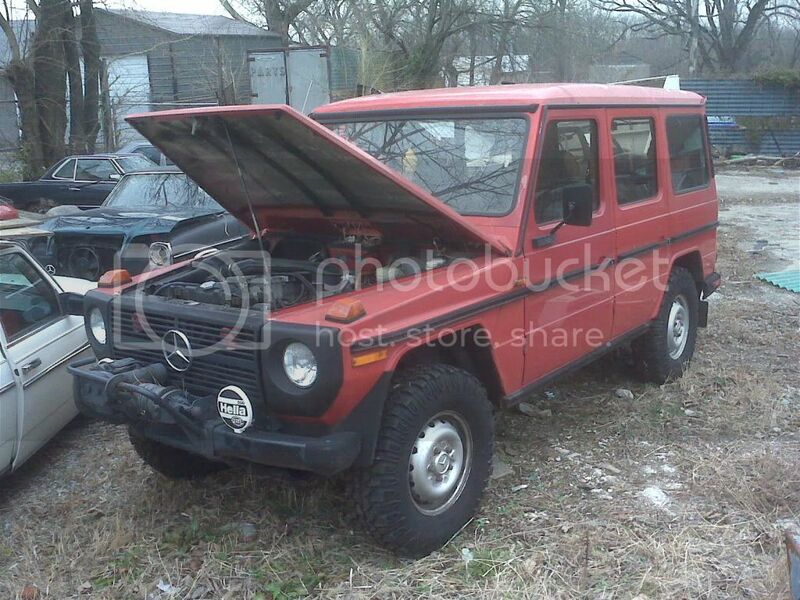 I dont know much about G wagens, and don't want to pay too much for it since i'll have to drop an engine in immediately. most likely a diesel conversion. Nice find. A 617A turbo diesel is the perfect engine for the swap you have in mind and you can keep the transmission. It's a direct bolt up. If that Rotzler winch is working, it's worth quite a bit. Those winches were a pretty rare G-wagen accessory. 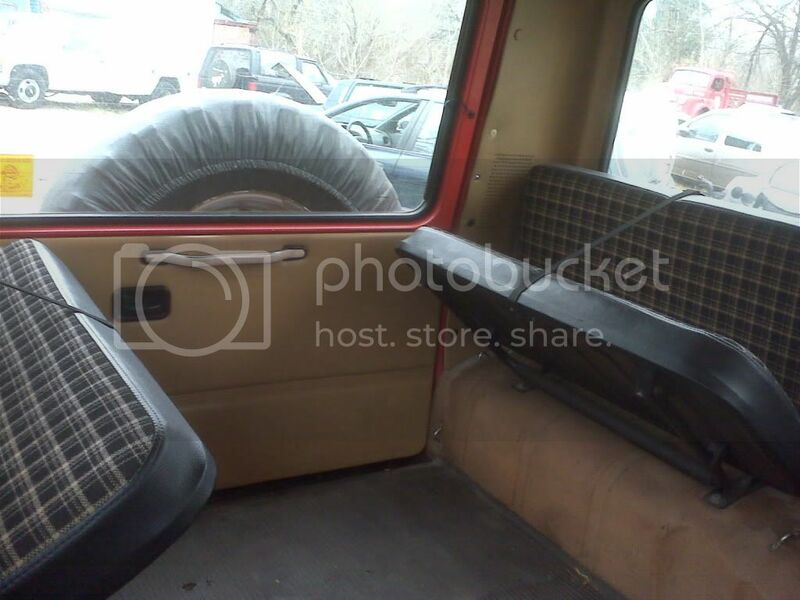 The side facing bench seats in the rear were not too common either. Give me a holler offline if you want more details on the swap. Sweet find!! What is it going for? that's what i hear about the 617A. I thought that winche was pretty rare, I dont think i've ever seen a pic of one on a G.
If i end up with it, i'll definitely be interested in as much info as i can get on teh swap. Here's the deal on the truck.... Right now, it's owned by a private MB shop, because the previous owner didn't pay his bill. Unfortunately, it's a little more complicated than a simple mechanics lein, because the titel for the truck wasn't in the "owners" name, it is in his mothers name. She is having financial problems and wants to sell it for as much as she can get, but it's not really up to her, since the shop technically owns it. However, she's friends with the shop owner so he wants to take care of her as much as he can, however, he's also friends with me so he wants to take care of me. so right now, we are unsure on a price. As i'm rather inexperienced in the Gwagen world, i thought i'd ask around to get some ideas as to what i should pay for it. I have tons of mechanical experience, i'll have no problems doing any of hte work on it, plus i have the resources of the MB shop for the stuff i can't figure out. I don't feel like i should pay anywhere close to blue book on it since it doesnt' even run and will require a couple thousand bucks probably to make it run. My mouth is watering just thinking about owning this machine, so i hope a deal can be made! Since I also am on the hunt, from my research I would offer $5k as a fair value given all the interaction of those involved. If it was running, and no issues w/ the 280 around $12k. Once the conversion is done, mid $20ks. That is when the decisions begin- keep it as you will be in for cheap, or sell for the profit... good luck, and nice find for sure. offer $5k, running and no issues w/ the 280 around $12k, conversion done mid $20ks. $5K is a good opening offer, the $12K may be a bit optimistic in the current economy. Check the last couple months of ebay sales and you'll see that most 280GE trucks struggle to get past $10K. The winch will help. Mid $20K with the 617A is not realistic. There are not too many of us out there that will accept a bare bones 6000# truck powered by a ~100hp engine. The market demand just isn't there. And the fact that the 2002/2003 G500's are starting to fetch mid $20K prices. The 463 chassis G500 is alot more civil, has almost 3 times the engine power and is just as capable as the early trucks. Check out this site where Drew Platt did an excellent job of compiling relevent G-wagen sites into one page. Do your research on the cost of parts. You'll soon realize that a couple thousand dollars won't go too far in getting this G back on the road. When you add the cost of a good 617A engine, the parts needed to do the conversion, a front axle rebuild (if needed and they usually do), brakes and lockers overhaul ... with a $5K purchase price you'll fast approach the $9K-$10K range. Still a good total price and you'll know the truck inside and out. There is a guy in Floyd's Knob who knows about as much as anyone around Louisville (or anywhere else for that matter) regarding G-Wagens. You can find him on P-3 under MerzBen. Or feel free to email me for his contact information. He also might have some parts or an engine for you. 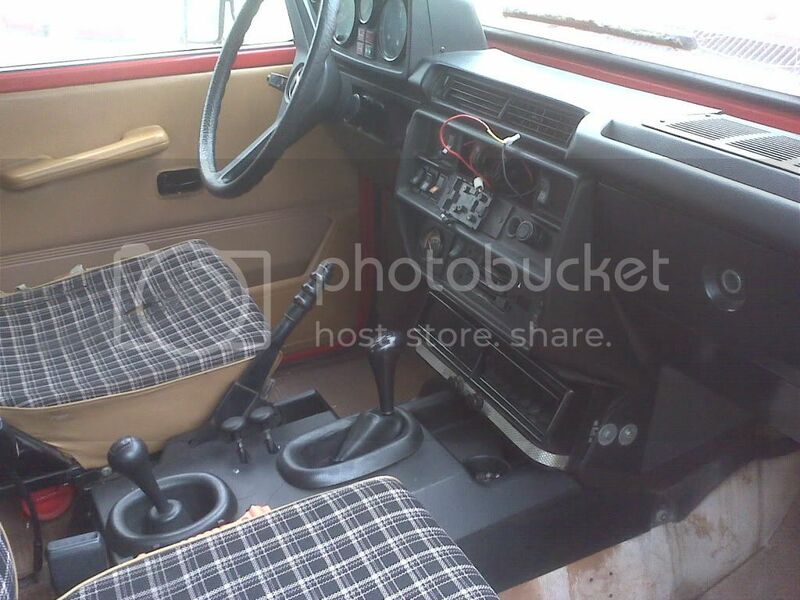 The interior of that truck is looking kinda ratty. Has that front driver's side fender been repainted? Or is it the door that is an off shade of red? Why is it running Truxus MTs? Has this truck been run hard in the bush? Is it really worth $5k given the engine is blown? Vehicles are not worth much with blown engines regardless of what make they are. I'm no expert on Gwagens but I've bought and sold a lot of vehicles. I'd offer $2k-$3k and that is only because it is a desirable vehicle. If they talk you up a bit so be it. And don't think you are taking advantage - a vehicle with a blown engine is effectively worthless unless it is a desirable enthusiast vehicle or the seller stumbles across a motived tradesman buyer. I believe i did see an a/c compressor... not sure though, just assumed it had it. not a deal breaker either way. i did notice the door seems to be different than the rest of the truck. i have no idea why he put the m/t's on there, it's never been in the dirt from what i can see. no mud caked underneath, no brush scratches in the paint, etc. i agree completely with you regarding the blown engine and price. Like you, i've bought and sold far too many vehicles to even remember, and i have ahard time paying more than a couple thousand for something i have to tow home and immediatley put an engine in, just to be able to drive it around the block to find out what else is wrong with it! A vehicle is only worth what someone will pay, and in this economy, old, heavy, underpowered, odd, low mpg, etc. trucks aren't commanding a premium, at least here in KY.